I’m continuing my Cinnamon Roll Week on the blog as promised with these decadent PB&J Cinnamon Rolls that can most definitely do overtime as breakfast, dessert, or even a snack. Earlier in the week I shared a recipe for savory Garlic Bread “Cinnamon” Rolls that were completely out of the box but something that you just have to try for your next pasta night dinner at home because they’re fun and exciting. After all, don’t we all deserve a little more fun and excitement in our lives on a regular basis? Anyhow, back to these PB&J rolls. Picture your childhood school lunches of peanut butter and jelly sandwiches. Do you remember how awesome they were even though they were all mushed up, on white processed bread and something you probably wouldn’t eat now? Well these rolls are exactly like those sandwiches we used to love, but so much better because white mushy bread isn’t involved. 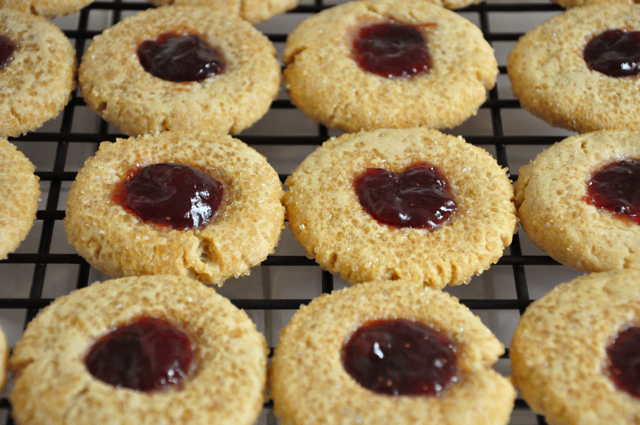 The homemade dough is flavored with peanut butter, filled with more peanut butter, and strawberry jelly, and then topped with even more peanut butter (I know, the madness never ends) and more jelly. It’s like a child’s dream come true in cinnamon roll form and it’s just in time for the weekend. Add them to your weekend to-do list and enjoy your new favorite treat. 5:50 in the early morning, 1996. The sun has just begun to rise over the rows of houses in a tiny and quiet neighborhood. Dawn is taking shape. High above—it spreads it’s light into the sky—casting with it’s descent, a colorful hue that mimics a cacophony of sound and color beyond the mountains. 6:20 in the morning. The sun has brightened and its warming rays slither through the far off distance, past the empty school, across the street. It finds its way through a white picket fence, and creeps over the trimmed lawn, painting its yellow color on the white walls of a modest family home. 6:40 in the morning. Tiny streaks of sunlight gleam through closed blinds illuminating certain areas of a disheveled and disorganized room. Remnants of a once-clean abode can still be seen beneath all the clothes, toys, and books that are thrown about littering the floor, shelves, and desk. Crowded, picture-laden, walls go undisturbed by the light that has made its way inside the unsuspected domain. As time ticks, by the light, emitting from the outside world, begins to grow stronger. It fights off the darkness within, and fills the room with a warmth that is not welcomed at this early hour. 7:00 in the morning and the alarm buzzes for the fourth time. Something stirs on the bed, and the sheets begin to rustle. Beneath the crisp bundled mounds of striped cloth lies an eight year old me awakening from a deep sleep. A tired, limp hand emerges from underneath a giant pillow, hitting the alarm clock. The buzzing sound ceases and the room is quiet once again. 7:20 in the morning. The boy dashes from the closest to the bathroom, back and forth. Rapidly brushing his teeth, combing his hair and putting on clothes, he prepares for school. The mad dash only intensifies as time slips away becoming more apparent that a tardy is in store if he does not hurry. He enters the kitchen and sees his sisters dressed and ready to go. Just waiting for him to finally make his appearance. He ignores their stares and scoffs—for the school is right across the street—and goes straight to the breakfast table where his morning fare awaits. No time to enjoy it at a reasonable pace, he practically swallows it whole without breath, without hesitation, giving off the impression that this is a daily occurrence. He has become accustomed to it. Only when stripes of maple syrup are left alone, on the plate, are they ready to depart. Ready to go to school and learn. One by one they each pick up their sacked lunches. Their names neatly written across the front brown paper, allows for no confusion as to which bag belongs to which sibling. The contents within are always the same. Expected and required. A fresh fruit, a string cheese, frosted circus animal cookies, a juice box and a delicious sandwich. The sandwiches vary from child to child revealing that their tastes and sophisticated palates are unique to each sibling. For the girls, a turkey with swiss on wheat, no crusts and a provolone and tomato no mayo, with plenty of mustard. The boy’s is much more simple and modest in flavor. Peanut butter (crunchy) and jelly (raspberry) on whatever bread, slightly toasted. The salty and sweet sandwich give him something to look forward to among the long hours stuck in a classroom. Each day he awakens not wanting to go to school, dragging his feet as he gets ready and makes his way to the kitchen where his sisters await impatiently. The only salvation that comes his way is knowing that his lunch will always be the same. Right there on the counter waiting for him to pick it up and take it to school. Waiting to be eaten and enjoyed. Only when he walks out the door with his brown sack—”Jon” written in block letters—can he face the day. Only then is he willing to make the best of what lies ahead, PB&J in hand. 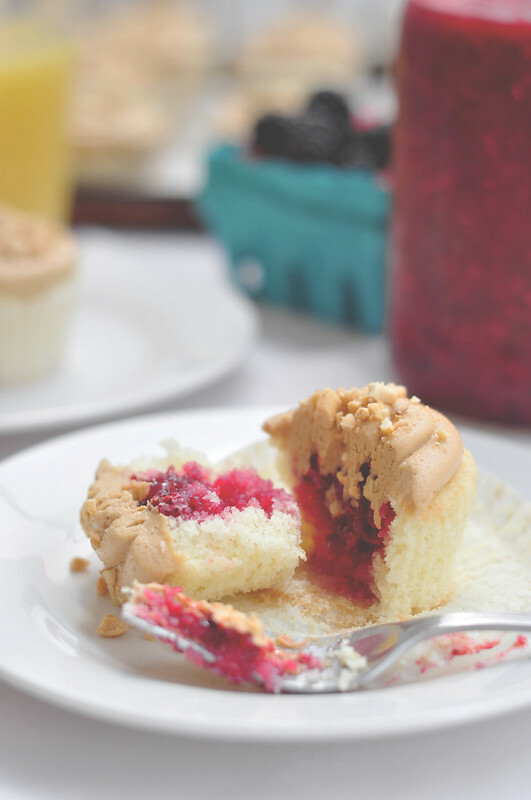 These cupcakes were inspired by that infamous PB&J of my early years in school. Flavors that mimic and recreate my childhood are paired together to construct a treat that brings us all back to the days of our youth. We begin by making the jam. Yes, the jam. You might not want to take this extra step in making your own jam, but I think you should! It’s super easy and a lot healthier. Healthier because you know all the ingredients that are going inside. Healthier because it is made without any weird preservatives or thickeners. If you make your own jam people will look at you as if you are a master in the kitchen. It works. Let’s make jam together. I’m using two types of fresh berries for this one. 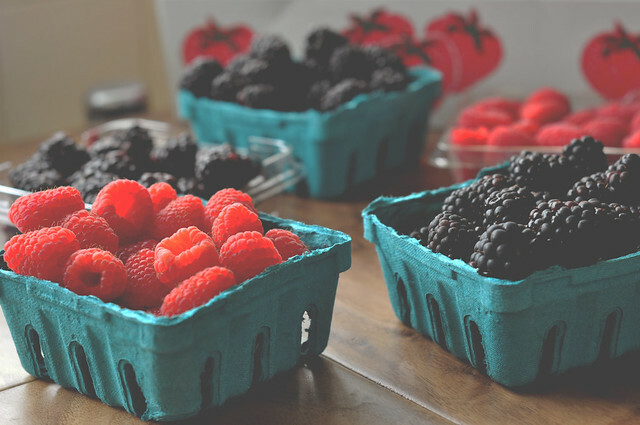 Blackberries and Raspberries. Why? Because I like those two flavor profiles together. But also because they were the best looking ones at the farmer’s market that week. You can use whichever fruit you prefer or whatever is in season. The bell rings and you’re instantly awoken from the trance you were under for the major part of class. You quickly realize that recess has finally arrived. You anxiously grab your super hero lunchbox and head over to eat with your friends. As you half run, half speed walk to your usual hangout spot you think to yourself, how could you possible get through the rest of the school day? As you open your tin mealbox, you already know what lies inside. A soft and yummy peanut butter and jelly on white bread, crusts cut off. In your head, you thank your mother for always making the best pb&j on the planet. Alas, your world quickly comes to a crashing halt. To your utter horror and astonishment, you notice that your sandwich isn’t that of a peanut butter and jelly, but actually bologna and American on whole wheat bread with seven grains. Toasted. With crusts. You cringe and groan in sad disappointment and start rummaging to see what else your mother has fooled you with. A banana; yuck. Healthy trail mix with raisins and nuts; gross. String cheese; ehh. You commend her for having something present from every food group on the pyramid, and make a mental note to ask where in the world is your PB& J. And then there it is. You spot it, like a lighthouse beam in a dark cold night. A glowing beacon of hope. Wrapped in colored plastic cling, you notice a pile of something sweet and decadent. Perhaps, your day isn’t all that bad after all. You carefully and oh so precisely unwrap the gift from the heavens. Immediately your nose is pleasantly surprised with the familiar aroma of peanut butter. And there in the center is the perfect amount of jelly. But knowing how your mother knows you well, it’s actually strawberry preserves. You make a leap of joy and start dancing as you eat the first cookie, making sure to hide the rest from your friend’s eyes just in case they get the inconceivable notion of asking you for one. After the second cookie you know for a fact that you’ll make it through the rest of the day. You stash the remaining two in your pocket, and eat them at strategically planned out moments throughout the day, to ensure a blast of happiness in a doldrum class. The bell finally rings to go home and you make a mad dash for your mother’s car. You give her a look of utter approval and thank her for the best cookies in the world. As you go on and on about just how great of a mother she is, she interrupts and say “Yes, there are still cookies at home.” And in hearing those words, you sit back, enjoy the ride and dream of nothing else but recess tomorrow, when you get to have not a PB&J sandwich but PB&J cookies, which you’ll happily have for lunch any day of the week.